Our Box Newel Mounting Kit is perfect for securing our newels to treads or flooring. 9406 – works with 6 1/4″ box newels. 9405 – works with 4 3/4″ box newels. 9404 – works with 5″ box newels. Comes with an 8″ lag bolt, washer, and the wood block (block will be made out of Yellow Pine). If you purchased our 6 1/4″ box newel then if you purchase the 9406 it will work correctly with the 6 1/4″ newel. If you have a box newel from another supplier we can custom manufacture the mounting kit to work with a newel with an opening of 4 5/16″. Does this mounting kit work with your Box Newel 4240? Thanks for your question. To mount our 4240 Box Newel, you should use the Sure-Tite Newel Fastening System rather than our Box Newel Mounting Kit. Let us know if there is anything else we can help you with. Would this work for installing to concrete floor? 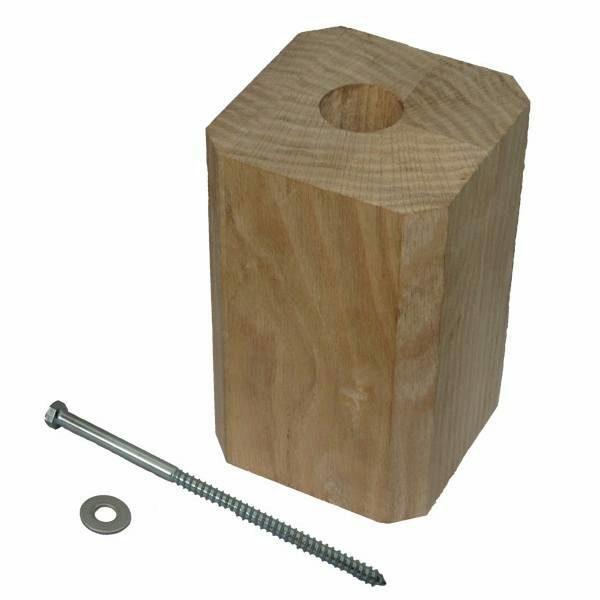 Our Box Newel Mounting Kit comes with a fastener designed to mount into wood. If you have additional questions, give our team a call at 1 (866) 226-6536. Is it common to shorten this mounting block to be able to get to the correct handrail height of 36-42 in? Background: if you add the length of newel post from handrail mounting position to where the bottom parts becomes hollow (36 in) and the length of the mounting post (7.25 in) you get to a height of 43.25 inches which is higher than the maximum handrail height of 42 inches. This indicates to me that I have to shorten the mounting block. Is that correct? We have had customers successfully customize their Box Newel Mounting Kit mounting blocks in the past, but we do not recommend altering the product or installing outside its intended use. If you have additional questions, please give us a call at 1 (866) 226-6536 to get in touch with a customer support representative to walk you through your custom installation needs. Hi, what do you recommend for install the newel on a concrete floor? Kristine, thanks for the question. Our Box Newel Mounting Kit comes with a fastener designed to mount into wood. If you want to discuss customization options, give our team a call at 1 (866) 226-6536. What’s the size width and length of the 9406 (6 1/4) mounting block? I’m needing to see if this will fit right in front of my pony wall before placing the newel post on top. Thanks for the question Tim. The dimensions are 7 1/2 x 4 1/2 (square). I am making my own box newels. The inside dimension is 3 1/2″ x 3 1/2″. Do you have a kit for this size or can you make me some (I need 9 of them). Is the mounting block slightly undersized to ensure the newel can slide easily over it? Thanks. Thanks for the question Eric. 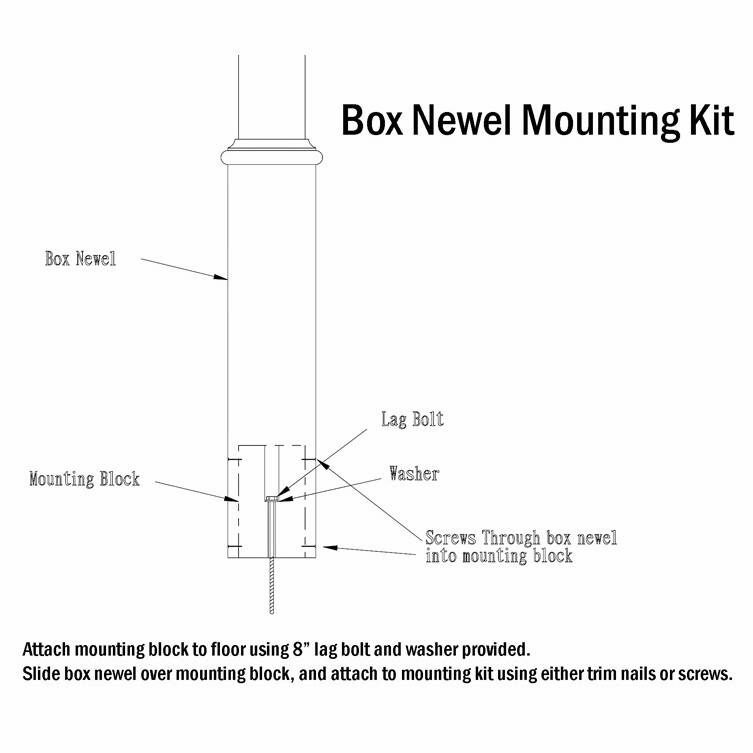 Our 9404 box newel mounting kit for 5″ box newels should fit a 3 1/2″ opening. Our 5″ box newels have the exact same sized opening. I’m looking for a mounting block that would fit a Newell with 3” square hollow opening. Does any of these happen to have that dimension? Thanks for the question Chris. Our smallest Box Newel Mounting Kit would be for a 3.25″ x 3.25″ opening. If you would like to use it, you could get it and trim it down to fit your newel.